Often, the best home decor is inspired by nature, found in nature and doesn’t cost one penny. That is “Decorating on a Dime” at its finest, or in this case, “Decorating for not even one dime.” Often, we stop at adding freshly cut flowers to our favorite vase, but the ideas on decorating with nature are endless. I passed many pieces of this dirty coral at the beach. It was wet, a bit slimy and blended into the sand. The bigger issue? My eyes were not open to the possibilities that existed to showcase this as a decorating wonder. (My daughter opened my eyes :)). Isn’t it breath taking? It’s so unique, and yet often we pass by possible decorating items like this with out a blink. I should have known better. 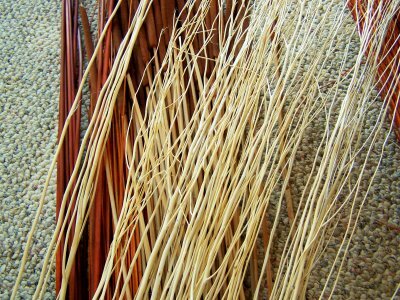 I’ve been inspired by my dear friend Kimba who opened up to me the world of decorating with sticks. How simple, frugal and yet a wonderful touch that any decorator wanna-be could attempt. 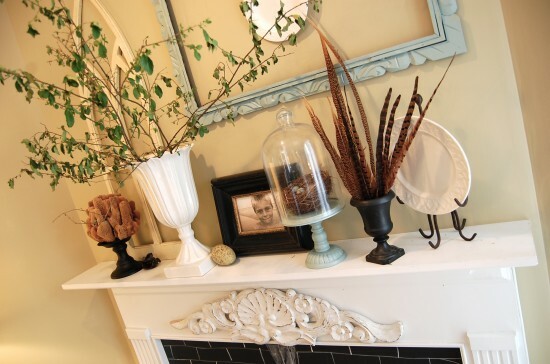 Starting by looking around our home and yard, we probably have many of the items at our finger tips to make our mantle amazing. Look how elegant she makes decorating with nature just by things that we already have on hand. Not that any of us need permission, but sometimes the idea of House Beautiful can be enough to make us not even want to take the first step towards making our house a home. Peek outside your windows. Is there anything in nature that you can bring inside to brighten your day? I’d love to hear how you decorate with nature. I grew up in Hawaii and we used beautiful found shells in some of our decorating. My parents were given a huge branch of black coral (I don’t think you can get these anymore) as a gift years ago. They have used it on their wall as a piece of sculpture and it is gorgeous and such a conversation starter. Now that I live in Eastern Washington State we have taken to decorating with driftwood found at the river or lake, interesting and varied stones found at the lake at my parent’s home in Montana and pinecones of all shapes and sizes. We decorate with shells, wildflowers, etc. I found this really cool tree down by a creek in our yard that has beautiful twisted branches. They look now grace several corners of my house. Pinecones and cuts from evergreens are great in winter! 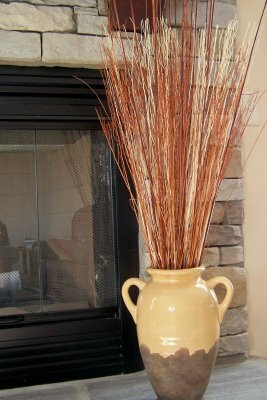 I love bringing nature indoors to decorate with, and if you are just aware of the possibilities, it can be super easy. In the summer, I love to just have fresh fruit in a collander on the island for a few hours. The smell is wonderful and beautiful to look at. In the fall, I love to collect acorns and put them in a pretty hurricane lamp, surrounded by leaves from our yard. Coffee beans are another pretty filler for pretty jars…the list goes on and on…. I love nature indoors!! Beautiful job!